Buying at source might have made buyers and exporters richer for decades, is becoming something that restricts their capacity to plan, and undermines their competitiveness when prices end up based on speculative produce sourcing rather than on the cost of production. Investment undertaken by medium and large operators in production itself is bearing fruit that is crucial to the sector’s long-term progress: 14 Italian companies have signed agreements with large, global variety developers – Sun World, IFG, SNFL, AVI – and have around 1,000ha of new varieties of seedless under licensed production, excluding free varieties like Crimson and Regal Seedless, or the Superior Seedless–Sugraone variety, which was planted under the misapprehension that it was a free variety. There are more than 50 seedless varieties, segmented by harvesting period and colour, which excel in various characteristics: per-hectare productivity, ability to fully develop the desired colour, taste that meets the market requirement, simplification of agronomic techniques, and extended seasonality (particularly in the later period, from October to November). It is estimated that 80 per cent of new seedless plantings are licensed varieties, while the impulsive development of Regal Seedless – an interesting variety for growers but second choice in the market – is finally slowing. Interest in international varieties has triggered a virtuous circle that has revitalised domestic varietal development programmes. Three private initiatives recently took on the work of some active research programmes that were functioning but at a reduced scale, creating three new projects: Grape & Grape, founded in 2016 by seven members, already has 252ha in production with the varieties Luisa, Fiammetta and Apulia; Italian Variety Club, founded in 2015 with an annual budget of €300,000, is focusing its research on obtaining new hybrids from Italian varieties known for a long time in Puglia; and Nuvaut, a private initiative which uncovered 36 varieties developed over the years at the CRA centre for public research. The enthusiasm and competence of a new generation of agronomists is consolidating the process of introducing new varieties in different production areas of Puglia, making the innovation process quicker and more dependable. Adapting over the past few years has often been difficult, even casting doubt of the validity of grapes like Sugraone for which it was not possible to find the right agronomic techniques to produce good results. 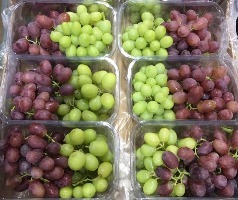 Some areas of doubt continue to cast a shadow on Italian table grapes’ new path of development, notably the stubbornness of modern Italian retailers when it comes to introducing seedless varieties, the fact that production, handling and logistics costs are often higher than those of direct competitors (Spain and Greece), or the incomprehensible delay in Sicily’s varietal evolution. But the road taken by entrepreneurs in Puglia is destined to bear fruit on national and European markets, opening a route to global markets. Hidden behind the 1 per cent of Italy’s total table grape sales that currently goes for overseas, there is enormous potential that could soon be developed.